As labor progressed, we left the pictures in the hall and returned to our room. The work was harder, now, but still full of hope and excitement. Once I had my epidural, there was even laughter! And then it was the final push and at last, at last! The baby girl I had been dreaming about for all my life was here!! The nurses weighed her, bundled her up, and placed her in my loving arms. But as I gazed for the first time on that beautiful face, my heart stopped. It actually filled not with hope, but fear. This beautiful, beautiful miracle rainbow baby was not the little one I had expected. She was markedly unique. As I looked on her in shock, no one around me said anything. No one even looked at us. I had to ASK, and with that asking came a sense of shame and brokenness. There’s so much you don’t know in those first hours during and after a birth diagnosis. You don’t know, for instance, that everything will actually be ok, even though you feel like your world just fell apart. You don’t know that your heart will fill with ten (100?) times the amount of love and even thankfulness that it feels fear in that moment. I know a lot of moms regret the initial feelings and thoughts they had in that moment, but I try not to judge myself too harshly. Because it’s new, and it’s painful, and you JUST DON’T KNOW. But the emotions are real, and they have to be dealt with. And I was not in a good state of mind when they took my baby to the NICU and took me to my room to “recover.” The first thing that greeted me when they wheeled me into my room was a large picture of a perfectly healthy, typical newborn. It seemed in that emotional moment like an affront. A brutal reminder of what then seemed like a lost ideal. “That’s not my baby,” I thought, in shock. The whole time sweet Lydia was in the NICU I walked up and down the halls of Mom and Baby from my room to my daughter’s, passing picture after beautiful newborn picture. There were full body shots and detail shots of babies of both genders and every race. But there were no special needs babies. There were no NICU babies with monitor leads or tubes. For the first time in my life, I was part of a real minority group living in someone else’s world. And it hurt. This is the picture that now hangs in that hospital. It doesn’t match any of the other carefully posed and minutely edited images that hang alongside it. It was taken on a hospital bed surrounded by beeping monitors instead of in a studio surrounded by fluffy props. But it is real. So real. That’s my girl, and she, like so many unrepresented babies like her, is beautiful. While it is flattering that my girl is now the one whose image is on the walls, that’s not the most important part. What matters most is that these kids are represented and valued and their lives are celebrated, just like everyone else. It’s a lesson we learned early in this journey, and one I am entirely passionate about. Through a series of miracles, I was able to befriend online (and eventually meet in person) the mother who sent the email to the hospital, and her darling, amazing girl. We’ve messaged each other almost every day since then, and they have truly welcomed us into this community and offered such love and support. We consider each other dear friends. It is amazing how God will place just the right people in your life at just the right time. That mother not only reached out to me in love in a critical moment; she also empowered me. Through her example and influence she taught me about value and love and advocacy and what being a special needs mom is all about. This account used to be my photography account, before it got hijacked by more important things. And with this hospital photograph thing I’ve thought a lot about that. I hope, in the future, to use my voice and Lydie’s light (as well as some of her friends’ if they’ll let me) to "put these kids on the wall” as it were. Because now I know what I didn’t before: that they are beautiful not broken, and life with them is beautiful and full of hope and completely worth celebrating. Is there a picture of a child with critical care or special needs hanging on the walls in your hospital? Write a letter. Give them a call. Let's get those kids up there. A close friend recently delivered at our same hospital and sent me a picture of her son “meeting” Lydia. Post Op Day 2 - Off the Vent! Little Lydie is doing well, today! She is making small but important strides. We started feeding her (yellow nose tube) today and I am sure that feels good! You’ll notice she still has the ventilator tube in her mouth. That was going to come out today, but girl took things into her own hands and extubated herself at 4 AM last night. Ouch, but can’t say I blame her—no one likes a tube in their throat. The nurses were right there to put a new one in and she’s fine, but did cause some swelling to her poor little throat so they are giving her an extra 24 hr for that to calm down. Also she is well swaddled, now 😉 They’ve been weening down the vent today in hopes of extubating early tomorrow, so both those tubes could be gone 👏🏻👏🏻 Her heart looks good and some of the things we thought would be huge problems she has just cruised through! 💪🏻🙏🏻 Her heart rhythm is still a little off, so we are hoping that issue resolves in the next couple days 🙏🏻🙏🏻🙏🏻 All in all she is doing well. It’s hard to see her like this, but we stroke her and talk to her and keep in mind that this is all baby steps to a better life! Huzzah for modern medicine!!! I have never felt more proud or more privileged to be a mom. 😭💗 #heartwarrior #theluckyfew #misslydiefaith #shouttheirworth *** Surgery went well. There are some big things we are still waiting to see as time unfolds here in the hospital, but she is doing great. Heaven has been near today. God is good. Man, we love this girl!!! THANK YOU for being there for us! I'm running out of words. Well, actually, there are plenty of words--the essays come spilling out of me at 4 in the morning while I stare into space willing myself awake and praying for my baby to eat. But those aren't the kind you share on the Internet. Sometimes when you're too honest, people get weird. And frankly, I don't owe those people anything. I think it's important to remember that. But I do owe myself some things, and self expression is healing for me. I also think about the other mothers going through similar things now or in the future. The least I can give them is honesty and an accurate picture. Some of my greatest comfort these days comes from reading the words of other moms who have gone through the impossibly hard and made it. The problem with that is, you have to write about the impossibly hard, too. First, I'm tired. There's any mom tired, there's mom of a newborn tired, and then there's whatever crazy planet we're on tired. And that's WITH all the help flooding in from family and friends. This is hard. I've done some hard things in life, but this has got to be the hardest. Watching my baby struggle like this is hard. While she isn't doing horribly (thank heavens), she isn't doing well. Sometimes it's scary. And for a mother, it's heartbreaking. We, and usually I, feed her every two and a half to three hours (four at night), always for at least an hour, sometimes up to two at a time. She gets down 45-80 mls or about 1.5-2.5 ounces. We're supposed to hit a minimum of 15 oz total a day, but for a whole week we were well under that. She weighs 10 lb 12 oz, which is actually up from what she lost during our awful feedings last week. She eats as much as a NEWborn, as often as a newborn, with the skill and stamina of a premie, at 3 months old. On good days she's observant and communicative, and her grins are HUGE. Happiness just streams from her. On the not so good days, her eyes are listless, her skin is pale, and her smiles are few. Sometimes she cries, except she doesn't have much energy to cry, so she either sounds like a normal baby who burns out really fast, or she just emits these barking, abbreviated calls of distress, because that's all she can muster. I've seen her hands turn blue. Sometimes she coughs and it sounds scary because there is fluid in her lungs. Always, when she breathes, her chest retracts because it's just so hard. And even though the doctors are watching her closely and she's on some medication which is starting to help a bit, I know and have a moment by moment visual reminder: this is no joke. I have a special connection with this baby. I can look in her eyes and KNOW her. Sometimes, when she is struggling to eat and fussing and upset, we'll lock eyes and I will sing to her. And in that moment I see and feel her latch on to me for strength, desperately reaching out to me and pleading, "Can I do this?" "You can do this," I tell her. "We can do this." She believes me and pushes through. I watch her do it. There's nothing more humbling or inspiring than that. She is a warrior. Some days, in between feedings, I fall on my knees and beg God for help. Often before feedings, and during feedings, I pray that she'll be able to do it. I pray for her, I pray for me. I pray for strength and for a bright future day when my baby girl can be just a baby girl. When we'll blow bubbles and buy headbands and go outside. When I won't fear every second that maybe I should call the doctor NOW and make him fix her!! Hurry, fast, before something really bad happens. It's heavy. It's heavy and it's hard and it's sacred. I remember hearing once that when George Washington was leading his farmer troops through the snow in the winter, they left bloody footprints behind them in the snow. I've heard similar stories about Mormon pioneers. People hurting and giving everything they can for a cause they love. Sometimes, I marvel that while I'm walking around in Target, there isn't a visible trail of my own bloody footprints marking my every step. Only it's my mama heart that's bleeding out--all the time. I know. Dramatic. And I said I wouldn't vocalize my 4 AM thoughts. Sorry. To be fair, I don't go to Target at 4 in the morning. But back to the sacred. You know the cheesy and over-quoted Footprints in the Sand poem? The one where Christ tells the narrator He carried him through life's hard spots? It's less cheesy now, and more a living principle. Because no one can do this on their own. Because the only reason I can get up in the morning and face the day is because Someone Else gives me the strength and grace to be able to do it. Do you know what's amazing? What's inspiring? What's incredible? What's amazing is how many people can come together to help you when you need it. How many people love your daughter with all their hearts, even if they haven't met her. What's inspiring is learning first hand how, "The worth of a soul is great in the sight of God"
What's incredible is knowing your own limitations--your complete dead end, ain't goin' any farther than this, I CANT'S; and watching God redefine them by adding His CAN. We're in the hard part. I know that. The success rate for these kids after open heart surgery is amazingly positive. Like 99%. Her defects are fixable. I thank God for that. She will learn how to eat, come off her oxygen, and be her happy, full-spirited self. We're just in the middle. In the middle with our eye on the horizon, trying not to get sucked down amidst the progress we can't see that we're making. While the whole time, God truly carries us. That is a truly sacred place to be. "Fear thou not; for I am with thee: be not dismayed; for I am thy God: I will strengthen thee; yea, I will help thee; yea, I will uphold thee with the right hand of my righteousness. ...For I the Lord thy God will hold thy right hand, saying unto thee, Fear not; I will help thee." My all-time favorite scripture: Isaiah 41:10 & 13. "If we give our heart to God, if we love the Lord Jesus Christ, if we do the best we can to live the gospel, then tomorrow—and every other day—is ultimately going to be magnificent, even if we don’t always recognize it as such. Why? Because our Heavenly Father wants it to be! He wants to bless us. A rewarding, abundant, and eternal life is the very object of His merciful plan for His children! It is a plan predicated on the truth “that all things work together for good to them that love God.” So keep loving. Keep trying. Keep trusting. Keep believing. Keep growing. Heaven is cheering you on today, tomorrow, and forever." Ok, I was able to get Lydie into the cardiologist, last week. He talked me down from Defcon 5. :) She is actually in heart failure "But that's just what we call it...." (Relax, Mom?? Right.) Her heart is just working really hard and it is affecting her body, as I said before. But, it's also not uncommon, and it doesn't mean she's going to die or anything. He gave us some medicine to get rid of some of the weird symptoms that were alarming me and the pediatrician. Hopefully they will help her body AND she'll start to eat better. We also quadrupled the amount of formula we're adding to her breastmilk. So basically she gets a chocolate shake calorie haul every meal. We have 2 lbs to gain optimally for surgery, but if she doesn't respond to the medications we may look at moving the surgery up, anyway. The feeding tube thing is always an option if she stops eating enough, but he didn't think they would admit us to the hospital for that clear until surgery--she'd just be on one at home. In any case we're trying to avoid it. They tell me that eating is like running for her, and she just does it 7-8 times a day for 60-90 min... no big deal! Poor thing. She's tough! She really really REALLY can't get sick, so nobody visit us ever, and someone adopt the two boys, k? Haha. Actually I just bought some facial masks and am about ready to say nobody but Mom and Dad can come in Lydie's room. An illness would be 1) super scary and 2) put the surgery back TWO MONTHS. So we're doing all we can to avoid that. We have not scheduled the surgery yet---they usually schedule them 6 weeks out, though, so he told me it could be "soon." I have my next appointment with the pediatrician in 2 weeks and the cardiologist in 3, if all goes well. In positive news, I asked, again, what things will look like for her after the surgery, and it's super optimistic. She shouldn't be any more susceptible to illness than a regular kid with DS, which is a huge blessing because some of these heart babies are very very vulnerable all their lives. And the problems that she has are fixable. They keep telling me that, and after reading about what some other families have to live with--I will TAKE IT. Man, life can be really hard. So, anyway, onward we go! Thinking chubby, healthy thoughts! It's crazy, but it won't last forever. We're going to get this girl through this and she's going to change the world. She already makes ours so much brighter. Like, seriously. She's the best, cutest, happiest baby. They tell me that eating is just like running for her, and she does it 7-8 times a day for 60-90 min each time, all so we can get in those precious 15 ounces/day. My little warrior. Thank you to all who have been praying for Lydia. She needs our prayers and Heaven’s blessings now more than ever. At our appointment with the pediatrician on Friday, we learned that she has gained weight (!!!) but that she is also in heart failure. This is not unexpected due to her heart condition, but is hard news. Essentially, her heart is working too hard, cannot continue to do so, and her body is being affected. She is experiencing difficulty eating, increased difficulty breathing, and some other symptoms. We see a cardiologist next week. As miserable as those symptoms sound, she continues to try to eat, shows awareness, moves her body, and gives us giant grins when she sees us. The light and joy in her special spirit will not be suppressed. HOW WE LOVE THIS GIRL!! Given the stress on her heart, I would assume her surgery will be sooner than later, but that will be up to the cardiologist. Some children endure heart failure for weeks before surgery—it all depends. We will keep you posted. Thank you eternally for your prayers. We could not keep going without divine aid or the earthly angels Heaven sends us. I marvel that in the midst of so much heaviness and sorrow we can feel so much light and love. I truly don’t think it has anything to do with us, but is more a sacred opportunity to witness and experience Heaven’s love and power. We love you. We love Lydie. We are so grateful for God’s love and presence in our lives. We are blessed. I spend a lot of time listening to and pondering music, these days. During those long and sometimes frustrating feedings, singing or listening to music calms both me and Lydia. When I write these posts, I envision someone reading the description & excerpts, then listening to the song, one by one. Whether that’s what actually happens or not is up to you, but that’s what I had in mind if it helps these posts make sense. I love poetry, so this series comes in part from that. This is the "moving forward" set of songs and the ones that help motivate me during the hard moments. Truthfully, today was a frustrating day, so here's to sending good vibes out into the universe and hoping that tomorrow goes better. For acceptance. For driving down the canyon with your arm lazily riding on the wind out the window. For parking and sitting on a remote rock with your eyes closed while the sun warms your face. For finding peace with the here and now and realizing that life is beautiful, even with the hard. For seeing and appreciating everything with new eyes. The hardest part is over? From a mama to my baby girl. For the ten sizes my heart has grown since you came into our lives. For the tiny sacred moments that make everything else worth it and my awe at the depth of you. For love and peace and a very bright future. How long do you wanna be loved? Is forever enough, is forever enough? I’ve never taken an anatomy course. English teachers don’t need that. I can diagram a sentence, but I cannot dissect the human body. I mean, I know my basic bodily systems and where major organs are located (...I think...), but ask me to distinguish between the heart’s right atrium and right ventricle and I’ll change the subject real fast. Because I know those things are there but exactly where and what they do besides just ‘make the heart work’...?? I have no idea. Well, had no idea. Until Lydie was born. According to one book I read, about 40-60% of people with Down syndrome have heart defects. Whatever the exact statistic is—it’s high. So checking out Lydia’s heart was one of the first things the doctors did. They couldn’t hear any murmur, and our first x-ray looked good. In all the prenatal ultrasounds with MFM, her heart looked perfectly healthy. It wasn’t until we got our first echocardiogram that we learned that Lydia does indeed have heart defects. Four of them. When you’re in the NICU (at least in ours) and they run big tests like that it goes like this: tech comes and conducts echo on child. Tech forwards test images to off-sight cardiologist. Tech speaks with cardiologist and asks if more images are needed. Tech leaves. Cardiologist reviews images that day or maybe the next. Cardiologist sends report to hospital which is reviewed by the visiting pediatrician who then conveys the information to the parents. This is all to say we 1) had to wait for the results and 2) got the results through a pediatrician reporting the cardiologist’s findings. Which makes it hard to ask questions and get detailed answers. Dan wasn’t there when the pediatrician came to tell me the results of the echo. Wish he had been, since Dan HAS taken anatomy and probably could have explained it all to me. As it was, the soft-spoken pediatrician gently wrote down a list of conditions they had found, and when I looked confused drew a diagram for me. I recognized a few terms: “bicuspid valve” and “defect” being the primary ones. I knew what we were talking about was a big deal, but the pediatrician also said things like, “shouldn’t cause an immediate problem,” and “could fix itself over time.” So in my naïveté, I wasn’t as concerned initially as I perhaps should have been. Plus we were literally on our way out the door to have Lydia’s pictures taken for the hospital (more on that later), and I was running on the classic new mom quota of zero sleep, so my mind was a scattered mess. I’ve learned that it takes my uneducated self a couple exposures to medical information before I GET it. I’ve also learned to ask a lot of questions, take notes, and google the heck out of medical terms. Anyway. With three echos, an EKG, an x-ray and a dozen exams in the books, this is what we know. Lydia has a bicuspid aortic valve, a VSD (hole between two ventricles), an ASD (hole between two atria), and an open PDA (tube that should have closed right after birth). She will need open heart surgery, and we are planning on that occurring sometime this summer. It is a major blow and continues to be an enormous source of stress for me. Once again this is not the way things were supposed to go and is something you would never want your child to have to face, but here we are. Having said that, the surgical procedures that they will perform on her are very common and straightforward, and we have access to an outstanding children’s hospital and surgeons, for which I am grateful. It’s just open heart surgery. On my baby. I wish I could leave you with a peppy, optimistic view of the thing, but it all weighs pretty heavily sometimes. Not all blogs have to have a moral, right? Especially the kind of blog that is unfolding in real time as you learn to deal with life and that you write so people can know what you’re going through but you don’t have to experience the pain of explaining it a million times? Having said that, the prognosis is quite positive and the doctors tell me that once she has the surgery, she will likely lead a normal, active life. Her heart condition does affect a number of things right now—primarily energy levels and her ability to eat/gain weight, but we’re working through it. I will be glad once we have the procedure done and it can help her. The last two months have tested me beyond anything I ever imagined. Things I never considered happening in my life plan are now realities. I’m not a natural crier, but I tear up more than usual. I eat ridiculous amounts of dark chocolate. I pray, I study, I call my mom, I avoid awkward conversations with strangers (and sometimes anyone), and I crash in bed at night. Sometimes there is so much to feel that I just don’t feel anything. But I also sit and hold my baby and stroke her soft head and force feed her a million times a day so she can gain weight and just try to take it one day at a time and be grateful that we have her. Because she’s the sweetest, her smile is adorable, and her snuggles fill my heart. Sometimes when she’s sleeping I stare at her long eyelashes, analyze the red tint to her hair, or just listen to her breathe. In those moments I do feel. In those moments there’s joy and even peace. Music is powerful. I'm sure everyone can relate to listening to a certain song that takes them back to a specific time in their lives. Sometimes, during the last two months, when I couldn't find words to express my feelings, they came as song lyrics; a perpetual playlist running through my head expressing my doubts and fears, my hopes and motivations. As any mom with a newborn, I don't have a lot of time (or energy, or consciousness... hah) for deep thinking. My playlist is only 17 min long, which I can squeeze in pretty perfectly on my "I gotta get out of the house" runs to Target/Walmart every other day or so. So here are four of the songs that have been on repeat in my car and in my heart lately, and what they mean to me. I've included links to all the music if you'd like to hear them, yourself. This song comes from The Giver, which is one of my favorite movies. The movie celebrates living life with all its highs and lows. For those moments when responsibility weighs heavily on my shoulders, when everybody says "You're so strong" and I feel anything but, for when I need to remember that all the emotions and experiences are a gift, and for when I need to allow myself to be imperfect instead of a superhero, this is the song that plays. This one is my denial/how can we change the world song. For the moments when it doesn't seem fair. When I wonder how this happened and what we're going to do about it. For when I wish that things had gone another way, but it's out of my control. And then for when I resolve that no matter what the reality is, no matter what stereotypes are out there, we're going to embrace it, succeed, and prove them all wrong. How can we rewrite the stars? This song. I first heard it just after my first son was born, and I bawled my eyes out. Because, motherhood. It's always been emotional, but now it's even more significant. It was written to honor a little boy who passed away from cancer--co-written by his mom. For when I'm tired of the hospitals, the doctors appointments, the tests, and the machines. For when I can't think anymore about upcoming surgeries or how much life is asking my baby to go through. When I just want pick her up, snap the cords, and run away. This is it. When the blind hope turned to crying and screaming "Why?" What if I kept the hand-me-downs you won't grow into? What if the miracle was even getting one moment with you? And finally, the last one. For when I acknowledge that yeah, it's hard, but it I wouldn't change a thing. Because you are beautiful. You are beautiful just the way you are and our life with you is going to be wonderful. And maybe it's not what I planned it would be, and maybe I'll feel like I could fall 1000 feet at any second, but I'd still choose you again and again and again, and while we're up here on this crazy tightrope we're going to hold on tight to each other and enjoy the view. Never sure, will you catch me if I should fall? Lydia spent about two weeks in the Level 2 NICU, and I spent as much time with her there as possible. NICU life is a unique experience, and you kind of have to approach it in the way that is right for you. That approach will be different for everyone. For me, I needed to be with my baby. After the surprise of her diagnosis, I quickly found out that if I just stayed in my own room, my mind would race through all the “what if” scenarios it could come up with. Fear of the future and despair would overcome me. But if I was with Lydia, I could focus on living in the moment, getting to know her, and developing our relationship—which was much more healthy and positive for me. Dan had saved up a week of vacation for the baby’s birth so he could watch the other kids while I focused on the baby. As it turned out, he spent much of that week with me in the NICU, getting to know our daughter and familiarizing ourselves with her needs. We are incredibly fortunate to currently live close to both sets of our parents (after living out of state for the majority of our marriage), and the grandparents took over watching our boys while we spent time at the hospital. The opportunity to spend those critical first days together with Dan and Lydia was incredibly healing and strengthening, and will forever be one of the greatest gifts anyone could have given us at this time. I have always felt profoundly grateful for my labor and delivery nurses, but I tell you what, those NICU nurses who cared so well for us for those two weeks have a special place in my heart!! Because I spent so much time in the NICU, I got to know many of the nurses very well. They taught me how to care for Lydia in the NICU environment, they offered medical knowledge and advice, they provided me with educational books and resources and with baby supplies. They offered me friendship, comfort, and respect. They taught me how to stand up for myself and advocate for my daughter. They celebrated our victories with us and helped us come up with solutions to challenges. They bathed my daughter, put bows in her hair, created artistic signs for her bed, and carefully picked out her bedding and clothing. They watched over her day and night with love. I will always remember our nurse Amy saying in a moment of casual conversation with me, “Do these parents know how much we love their babies? !” Oh Amy, I know, and my mama heart is forever grateful!! My heart is so full when I think of those beautiful people who truly helped us during that crazy time. My boys had long awaited the new baby, and it was hard for them to not be able to see her immediately! Not to mention having Mom gone so much. They were such patient little troopers, and watching them meet and love on their new sister that first time was something special. I know they will be the best big brothers to her! 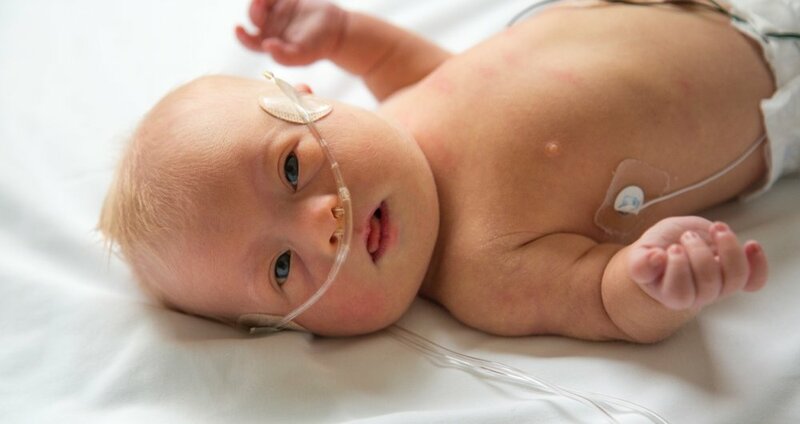 There were so many hard things about the NICU, but so many beautiful things, as well. As I look back, I feel tenderness for that time and place and those who shared it with us. It was such a sacred time of growing closer to Lydia, closer to each other as a couple and family, and closer to God. That is the first and only thing I have been able to write in my journal since Lydia’s birth, so far. Because it’s hard. To relive the memories and the emotions and honestly write them down is hard. But now, now that she’s six weeks old, I’m caught between “I need to write it down… maybe I’m finally ready…” and “If I don’t write it down now, I’m going to forget.” So we are going to try. It’s the question that everyone asks. Friends, neighbors, nurses, technicians. Everyone wants to know: did we know? The short answer is, no. We did not. It wouldn’t have made much difference if we had—we would have still welcomed our girl with open arms—but maybe I would have been a little more prepared for our first meeting. I’m shaking. My whole body is shaking, especially my hands. That’s how hard it is to relive this. To get it out. We went to the hospital about 9 pm on Friday night. Dan had spent a grueling day in job interviews up in Salt Lake, then had driven home in a snowstorm, picked up the kids from Grandma’s (she babysat them while I had a doctor’s appointment that afternoon), and we learned that one child was complaining horribly about an ear ache, so Dan ended up taking him to the instacare. Meanwhile, I was in labor, and trying to decide if my water had actually broken or not (it had). So with kids home from the instacare, antibiotics administered, everyone finally put to bed, and Grandma called to come over, we headed to the hospital where they admitted me and labor began in earnest. I was as prepared as I could be for labor, and it went smoothly. We walked around the hospital halls, looking at the beautiful pictures of newborns that lined the walls, wondering what our sweet baby girl would look like and what she would be like. In the room I bounced on a birthing ball and Dan applied counter pressure during my contractions. It wasn’t until I hit about an 8 that I said, “You know, this day has been long enough, let’s get the epidural.” It was my first successful epidural! The anesthesiologist was great, our nurse was sweet, and we laughed and talked our way through labor, anxiously and excitedly waiting for baby girl. Before long, I was pushing and then she was here! The cord was wrapped tightly around her neck, and she was “stunned.” They took her over to the bassinet and worked on getting her to cry. None of my kids have been criers at first, so I wasn’t worried about it. Sure enough, before too long they were handing her to me. The first thing I saw was a bright red face and a lot of blonde hair sticking straight up. Classic newborn attractiveness. I later realized that there is a picture of me as a newborn that looks exactly the same: swollen red face, blonde hair. Totally not my favorite picture, but also completely endearing now since my little girl looked exactly the same! But I didn’t think about that at the time, because I was busy looking closer. And that’s when I saw. While the picture above doesn't fully portray what I saw, her face had all the markers of a child with Down syndrome—the shape of her eyes, especially. But wait! MFM had told me she was fine! And all of a sudden that 2% of doubt that I had filed away until I could see her in person came roaring back to the forefront and became my whole reality. I knew. She did have Down syndrome. I was completely shocked and devastated. The nurse did come up. By a tender mercy from heaven, she “happened” to be someone who knew Dan growing up. I took so many human and child development classes in college that I lost count of them all, and as the nurse pointed out the markers to me (she couldn’t offer an official diagnosis), I knew what they meant. Poor muscle tone, low-set ears, almond shaped eyes, extra skin at the back of the neck, flat bridge on the nose, single deep crease in the hand: She has Down syndrome. I made a decision in that moment: I was not going to deny this. I was not going to hold out false hope for the results of the genetic test to come back. This was it. This was the proof. As unbelievable and shocking and hurtful as it was, this was real. My daughter had Down syndrome. Thus began the longest night of my life. I didn’t sleep. They turned off the lights, I laid down on the bed and closed my eyes, but I didn’t sleep. I prayed. All night long. I don’t even remember what I prayed for. Strength, probably. Perspective? Hope? That, since she was in the NICU, she’d be ok? I think I just reached out to Heaven because more than any other time in my life, I needed Heaven to reach down to me. To be with me. To help me through this. Because if I knew anything I knew this: I couldn’t do this. This was for someone stronger. Someone without my weaknesses. This was not for me. My heart was broken, and I was terrified. Hours and hours went by. I must have at least drifted into some kind of sleep because I had the sensation of waking up and realizing that it wasn’t just a dream. The nightmare was real. My heart was sick and bleeding. My baby was still gone and Dan and I were alone in the hospital room where a picture of a “normal” newborn hung on the wall looking down at me. “That’s not my baby,” was all I could think. That was probably the low point. In the morning, the pediatrician did come in. He confirmed that she “did have several markers of Down syndrome” (I guess no one wants to give the official diagnosis in a case like that without the genetic test results to back it up). I had already accepted this, but then that sweet man took me by surprise. Tears filled his eyes as he told us, shocked and grieving parents that we were, how special children with Down syndrome are. What a blessing they are to their families and to others. He cried with us and comforted us. In our moment of tragedy and trauma he offered both empathy and hope. I will love that man forever. The NICU nurse from the night before was back, as well. When the pediatrician was finished speaking, she added something through her own tears. “You need to grieve,” she said. “It may seem strange, because you just had a baby, but this is not the child you thought you were going to have, and you need to acknowledge those feelings and let yourselves grieve.” The permission to feel the hurt was a gift. Because you feel guilty crying over a precious new baby you’re supposed to be excited about. She was beautiful and strong, true, but completely different than what we were expecting. We were traumatized. We were scared. We were in shock. It was all so much to feel. And allowing ourselves to feel the hurt was the first step toward healing. Today is Easter and I’ve got to say, it’s an especially sweet one to me. We chose to name our daughter Lydia Faith before she was born; before we knew she had Down syndrome. Each of our kids has a church song with their name in it that we refer to as “their” song, just for fun. Lydia’s song goes with her middle name: Faith. 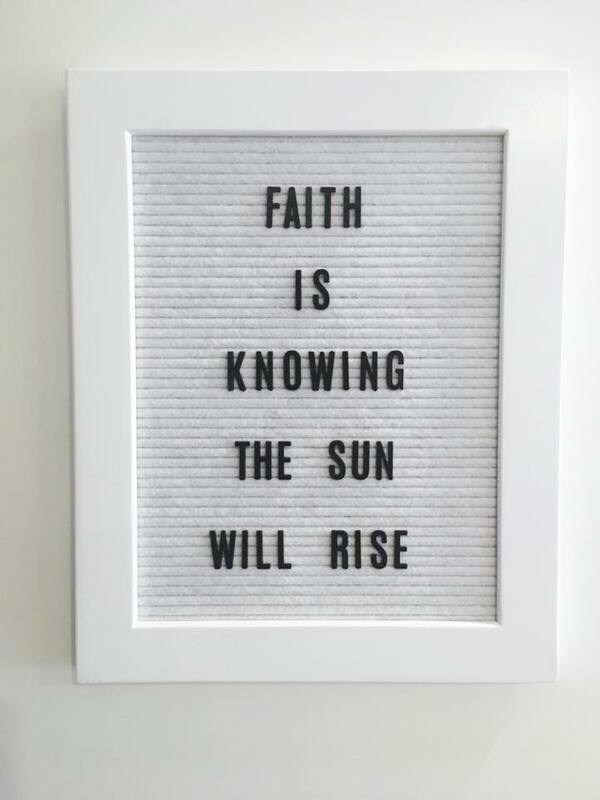 One night when Lydia was in the NICU, I came home for a quick dinner & to say goodnight to the boys, and found that Dan had put the first line of Lydie’s song up on our letter board. It’s meant as a metaphor to teach children about believing in things you can’t see, but in that moment it was more than that. It was a rallying cry, and an expression of hope and trust in the Savior. For a bit after Lydia’s diagnosis, our world was dark and very painful. There are still moments like that. Fear of the future, concerns about her health, heartbreak over the challenges she faces... But this morning as I sat with my boys around me and Lydia on my lap and we talked about the beauty and significance of Christ’s Atonement and resurrection I just felt so thankful. This life has challenges, some of which are very hard, but this life is not all there is. Because of Him, the sun does rise. Because of Him, one day my daughter’s body will be whole; and until then we are given hope and grace and beautiful learning experiences to get us through. I’m so grateful for that. I know He lives and that through Him we can all live—perfect, whole, and healed in all ways, again. Happy Easter. I’ve always been awkward around people with special needs. Never knowing what to say or how to act. How to relate and not offend. Feeling like it was easier to just avoid interaction and keep us all comfortable. To love and respect at a distance. That was me. And then I had a daughter with Down Syndrome and my world changed. Drastically. Pushing me way, way out of my norm and my comfort zone. Over the last three and a half weeks I’ve had the opportunity to care intimately for someone with special needs. To make major decisions regarding her care. To be the resident expert on her. And yes, even to be her advocate. And you know what it’s like? Basically just being a mom to my new daughter. Not to minimize her diagnosis. It’s also been a three week crash course in Down Syndrome; reading books, meeting with doctors and social workers, arranging tests, and planning for the future. It’s been emotional and eye-opening and life-changing. But one of those life-changing elements has been learning to see with new eyes. To look at my Down Syndrome baby and see… Lydia. Lydia the person, instead of her diagnosis. Lydia with her own personality as a unique member of our family and someone new to love. Just, Lydia. I’m not an expert on this yet, but I hope that with practice I’ll become one. That some day *Lydia* is all I’ll see. Of course, she’s a newborn, so there is a lot that you just can’t tell, yet. But, while it does profoundly affect our lives, there’s more to her than Down Syndrome. First, she’s curious. While she still sleeps much of the day, when she is awake she is actively looking around, EVERYWHERE. That little head and those little eyes are going, going, going. Trying to take in the whole world around her. I love that. Second, you should see this girl do tummy time. I remember subjecting my boys to this most miserable of newborn exercises, and they always gave it a few tries before collapsing in a face plant of infant tears. Yesterday I tentatively put Lydia on her stomach, expecting that with her low muscle tone she wouldn’t be able to do much and would quickly get frustrated. And it’s true, she struggled, but she didn’t give up. She didn’t collapse into tears. She fought. It was pretty remarkable to watch that little girl strain to lift her head, rest, then try again. She didn’t cry. She is fierce and persistent and determined. It amazed me and gave me a lot of hope. We’ll need exactly those attributes. Finally, there’s a quiet, optimistic peace about this girl that I appreciate. She is gentle and positive by nature, and that is a gift. And she likes to cuddle, which this mama loves. I’m so new at this. And awkward. And incredibly imperfect and humbled. But if there’s one hope that I have for my daughter and her future, it’s that people will make the effort to get to know her and love her and respect her for who she is: Lydia. And that they’ll allow and encourage her to be her fullest self. Today I’m grateful for all those who have gone before. For researchers and doctors and interventionists. For parents and teachers and members of society and friends who have realized that people with disabilities are people, first. And I’m grateful for Lydia. Who came to earth as her own person, and who already is a gift and a blessing and an expert at opening her mother’s eyes. Our time in the NICU was hard and healing and overall sacred time. We were there long enough to watch several other babies come and go with their families and I admit, I was jealous. Jealous because they got to go home, and sad because I knew that while most of these other infants would outgrow whatever brought them to the NICU, we were different. You don’t just outgrow a major chromosomal abnormality or the complications that come with it. That was hard. But that time was also healing. Lydia was diagnosed at birth. After that shock I found that I could either sit in my room and panic about the future, or I could sit with my baby in the NICU, hold her, get to know her, pray, and think, “This is you. This is me. This is today. We can do today.” We’re still doing that. She’s been here two weeks. It’s impossible to describe the thousands of emotions I’ve felt every day since her arrival. There have been so many prayers, so many tears, and so many tender mercies. Everything is different, but the love we feel is stronger. God’s grace is more desperately sought and given. We count our blessings more, big and small. We are learning. It’s a process. We’re in it together. 32 weeks, 5 days. I’ve never taken a picture like this, before. But I’ve never felt compelled to take a picture like this, before. This pregnancy has moved me in deep ways. This is my third. My first baby girl. Our rainbow baby after a hard miscarriage and long recovery. That alone makes it all significant, but there’s more. I’m a preeclampsia mama. Both of my boys’ deliveries were induced due to complications, putting all subsequent pregnancies at high risk. Of late, this pregnancy seems to be following the same course. I take my blood pressure daily, I pee on sticks at the dr’s office and at home. I worry, a lot. And I pray. For her, for me, for the rest of our family. That we can please do this and it will all turn out all right. I’m not as naive as I used to be. I find myself leaning on God more and more every day. And when I see that belly and feel Baby Girl moving inside, I am so grateful for grace and strength and growth and one more day.